"Thinking of you all during this difficult time. May Lily’s smile be with you forever and be a reminder of how amazing you all are. " Lily Harris was a precious 13-year-old girl who loved, and was loved by, her family and friends. Lily left us the morning of January 3, 2018. She passed away peacefully in her sleep at home, and on her own terms, which is how she led her life. Lily took after her mom and big sister in that she loved Disney. During her life she was able to see the Magic Kingdom and her favorite characters. Many kids are terrified of larger-than-life characters but Lily loved them. Fittingly to her love of Disney her long hair was often compared to Rapunzel’s from the movie Tangled. She got to see Washington DC and even see President Obama. Her full life wouldn’t have been possible if it weren’t for the love of her mom, dad and big sister, and their going above and beyond to making sure she was part of everything they did. They made sure Lily had the chance to be, as much as possible, just like any other kid, which is exactly what she deserved. Lily showed the world her strength ever since her first day on Earth. Lily’s mom, Adele, had a completely normal pregnancy. She, her husband, Wayne, and older daughter, Kaeli, couldn’t wait to welcome another daughter to their family. On July 13, 2005, Adele’s water broke and Lily’s umbilical cord was flushed out, cutting off her oxygen. She was born through an emergency C-section soon after. Lily survived because of her mom’s quick actions. Nurses in the neonatal intensive care unit (NICU) where Lily stayed for many, many, months, called Adele “the mom who saved her baby.” Due to her lack of oxygen at the time of her birth, Lily developed severe cerebral palsy. 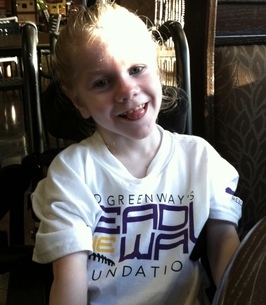 In Lily’s case, this meant she would have limited movement, and be unable to walk or speak. The complications Lily experienced while in the NICU are far too many to state here, including seizures, double pneumonia and intestinal problems; things she continued struggling with her entire life. The fact that Lily survived her traumatic birth is, in itself, remarkable. She wanted be here; to be with her family, and she refused to let her health issues prevent that. Despite an incredible number of complications, she persevered. Her strength and resilience aren’t something seen in many individuals, healthy or otherwise. During her life Lily proudly served as an advocate for all children who have disabilities through Children’s Miracle Network Hospitals and Gillette Children’s Specialty Healthcare. Both organizations were beyond honored to have Lily as their ambassador. Lily’s big sister, Kaeli, joined Lily as an ambassador. The love shared between these two sisters transcended words. Lily’s love for her sister was obvious to anyone, even though she couldn’t verbally express it. “Kaeli and Lily”; you can’t really mention one without the other. Lily’s life was, sadly, far too short. But it was a life well-lived, and a life that deserves to be honored and celebrated. The last few years were very hard for her, but they do not define her. What defines her is a full life of experiences that won’t be forgotten by the many people who loved her, and a personality that was all her own. Additional Information	Gathering of family and friends to celebrate Lily. We encourage you to share any memorable photos or stories about Lily. All tributes placed on and purchased through this memorial website will remain on in perpetuity for future generations. I’m so sorry for your family’s loss. She was a beautiful person. Thinking of you all during this difficult time. May Lily’s smile be with you forever and be a reminder of how amazing you all are.